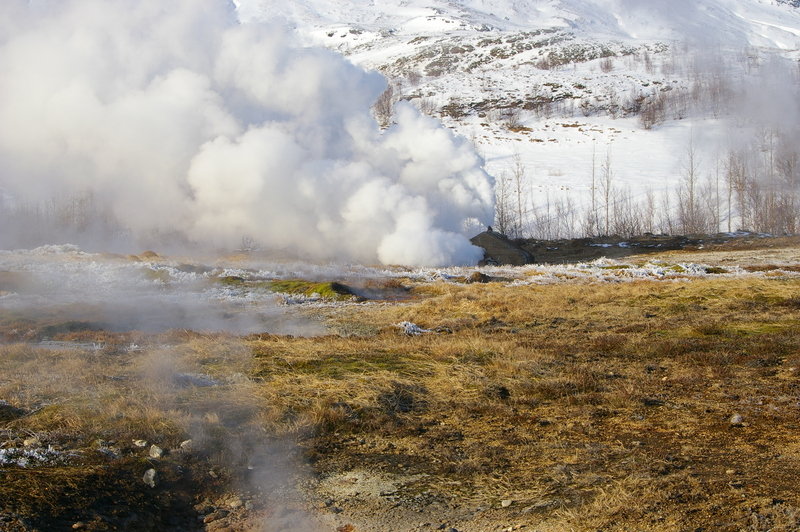 One of the most popular tours to take from Reykjavik is the Golden Circle. 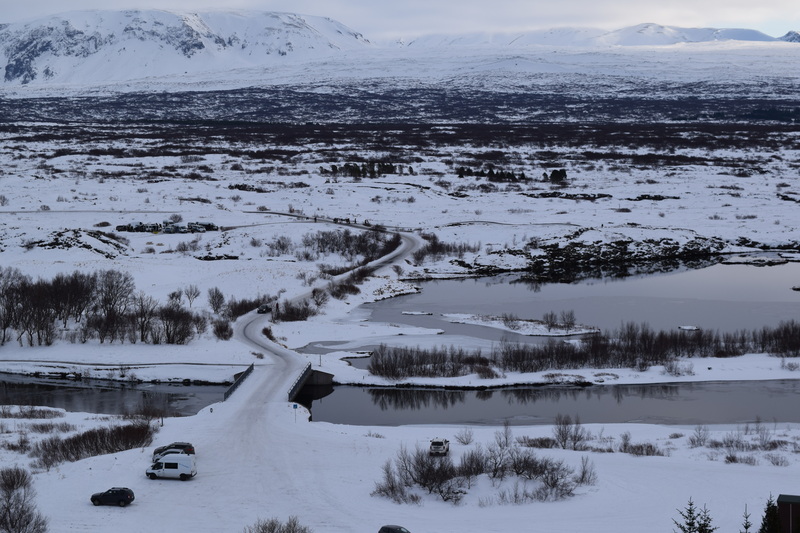 There are plenty of reasons why the Golden Circle is so popular and we were amazed by the impressive sights at each of the stops. Actual driving time is about four hours, but it takes at least six to eight hours with stops and hiking around to see everything that each destination has to offer. 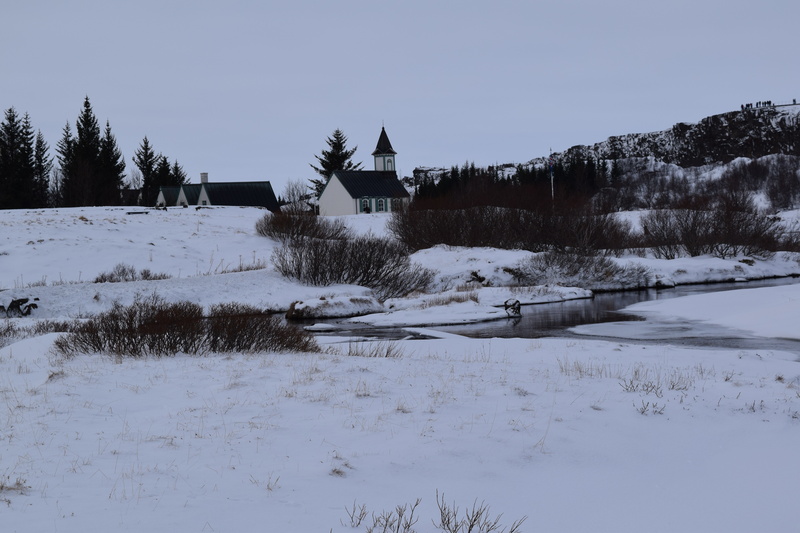 Assuming that you take the circle in the traditional direction, the first stop is Þingvellir National Park (pronounced Thingvellir in English), the second stop is Geysir, and the third stop is the Gullfoss waterfall. There are definitely some other stops that are worthwhile, but these three are “can’t miss” locations, each for their own reasons. 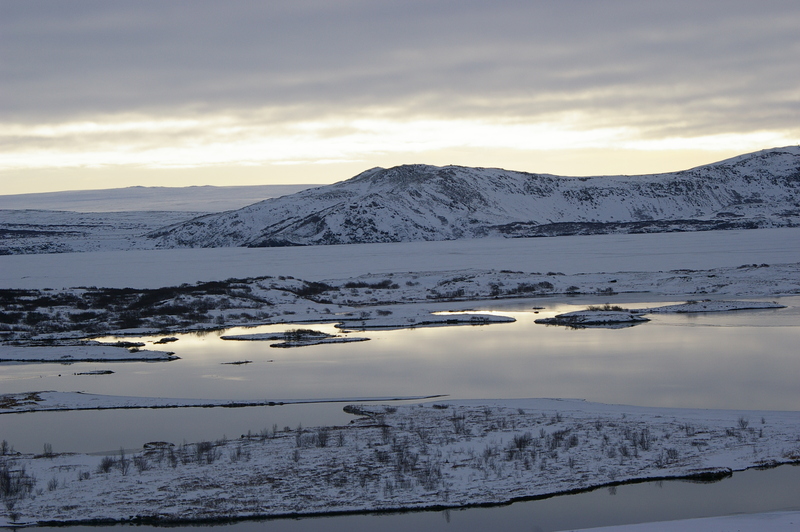 Þingvellir National Park is interesting for a variety of reasons. 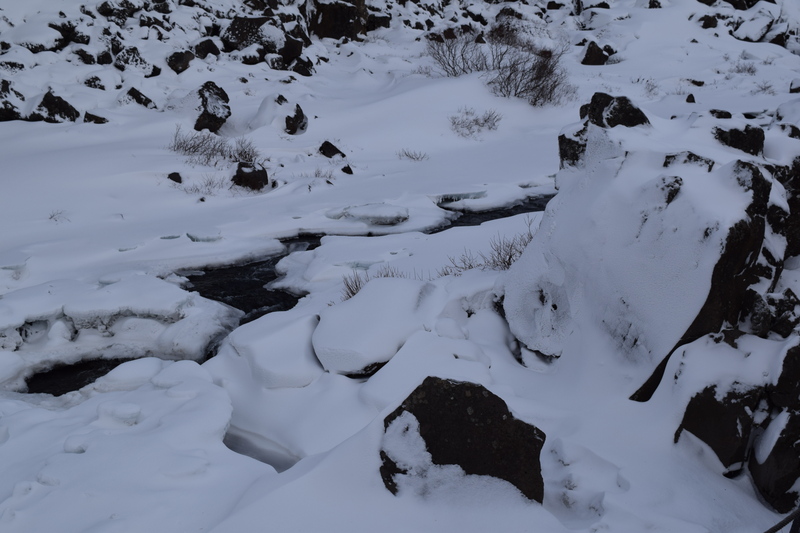 First and foremost is its natural beauty, which we’re sure is spectacular in any season, but since we were there during the tail end of the winter season, we enjoyed the snow-covered scenery. 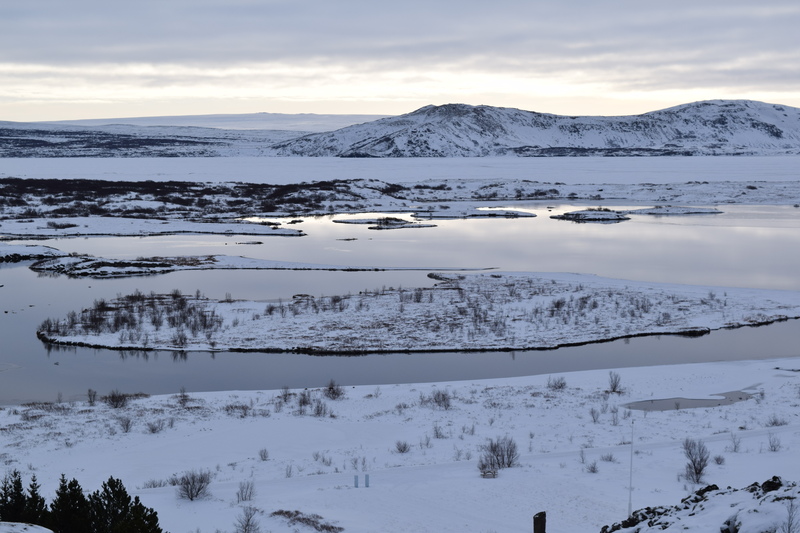 It is also home to the Mid-Atlantic Ridge, which is where the tectonic plates of North America and Europe slowly separate away from each other. 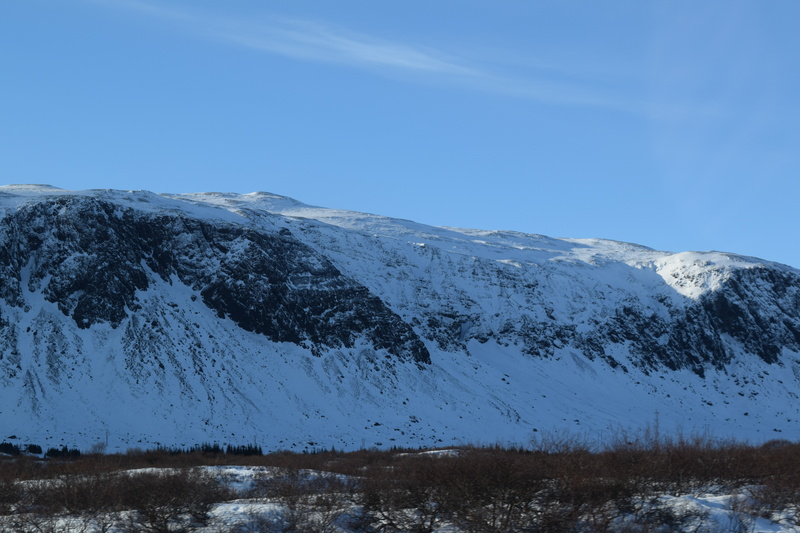 Iceland offers several opportunities to stand in both the North American Continent and the European Continent, but obviously Iceland is a European country. From a historical perspective, it is also the site of the first Icelandic Parliament, called Alþingi (Althing in English), in 930 AD, which we learned even more about during our visit to Borganese (more about that later). 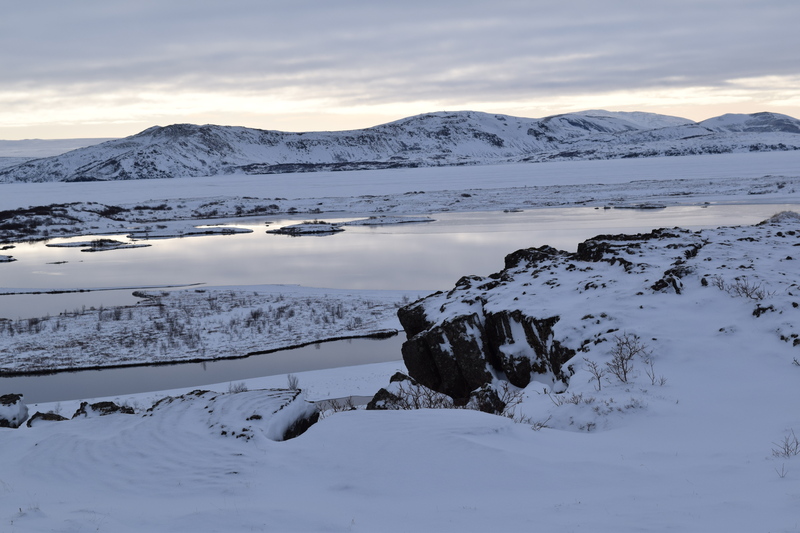 It is just north of the largest lake in Iceland, Þingvallavatn, which was mostly frozen while we were there, but still quite spectacular. Having rented a car, we were doing a self-guided tour as opposed to riding one of the busses filled with other tourists. We’re not a big fan of crowds, so we preferred to do it ourselves and do our best to avoid the throngs of tourists that were there at the same time as us. 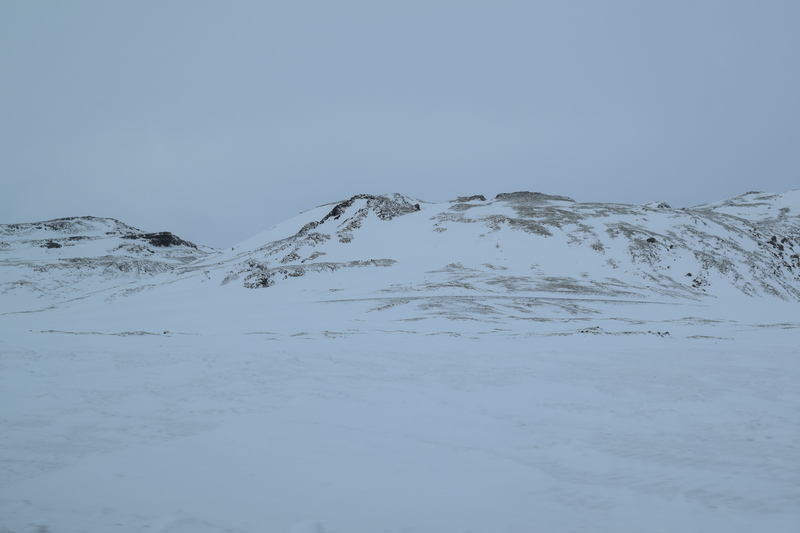 Despite the fact that we were in Iceland in what is considered to be their off-season, we found that there were plenty of tours running everyday, so we can only imagine how busy the summer season must be. The good thing for us was that we could wait a few minutes and the tour guides would cattle call their group back to the bus and at least for a few minutes, we would have relatively quiet access to each of the sites. But if you do rent your own car and do the tour yourself, be careful because the environment can be very harsh and one mistake could lead to disaster. 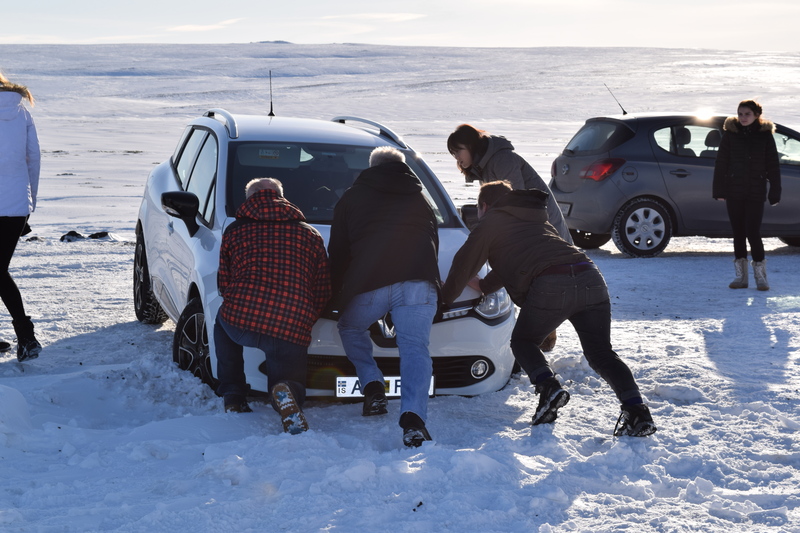 This didn’t lead to disaster, but a tourist plowed their car into a snowdrift and we tried to help them get the car out of the drift, but were unsuccessful. Fortunately they were able to call for help, but in these conditions it could have been disastrous. 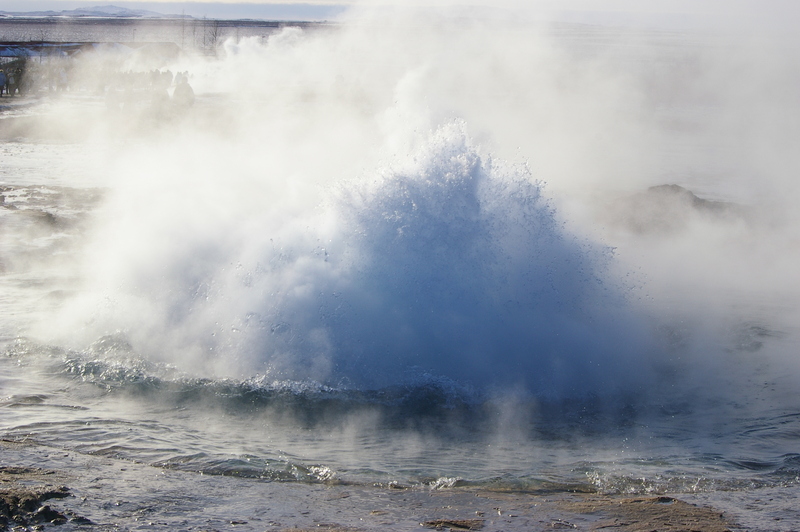 Geysir, also known as The Great Geysir, is a spectacular geyser and is what all other geysers are named after. 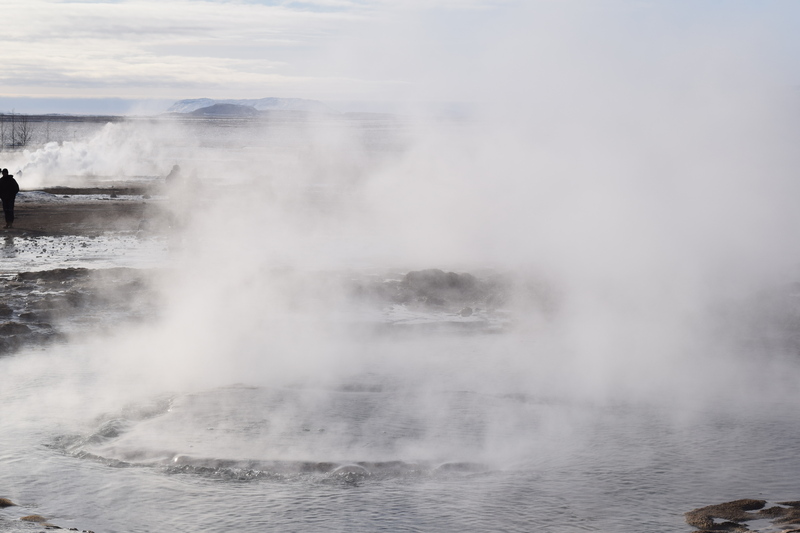 Obviously, Iceland is known as the “Island of Fire and Ice” due to all of the volcanos and thermal activity that occur throughout the island. 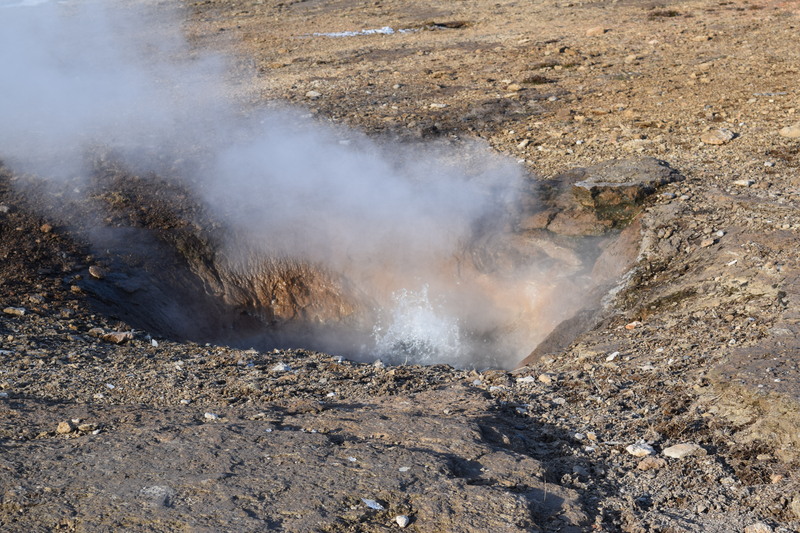 Hot springs and geysers can be found throughout the island, but The Great Geysir is the most famous, having been active for 10,000 years, although it can go dormant due to earthquake activity for long periods at a time. While we were there, it was quite active, erupting several times in a twenty to thirty minute stretch. Having been to Yellowstone National Park and seeing Old Faithful as often as we have, it was interesting to see as the water in the mouth of the geyser ebbs up and down until it reaches its crescendo. We had missed the hotel where we were hoping to have lunch, so we grabbed some fries from the cafeteria. 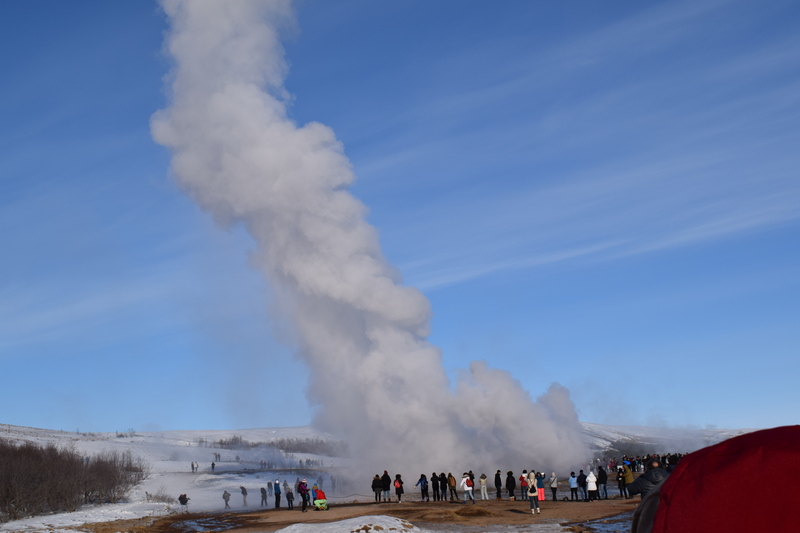 Since Geysir was obviously the lunch stop for the tour busses, we had no desire to sit in the cafeteria surrounded by the large crowds, so we figured we would just save our appetite for a delicious Icelandic dinner that evening. One thing that we did learn is that finding restaurants outside of Reykjavik is not as easy as it has been in other places we’ve visited. The countryside is dotted with wonderful little farms and small villages, but very few cafes and diners where you can grab a bite to eat, so planning ahead as to where you want to stop is a definite must. The final stop was the waterfall at Gullfoss. 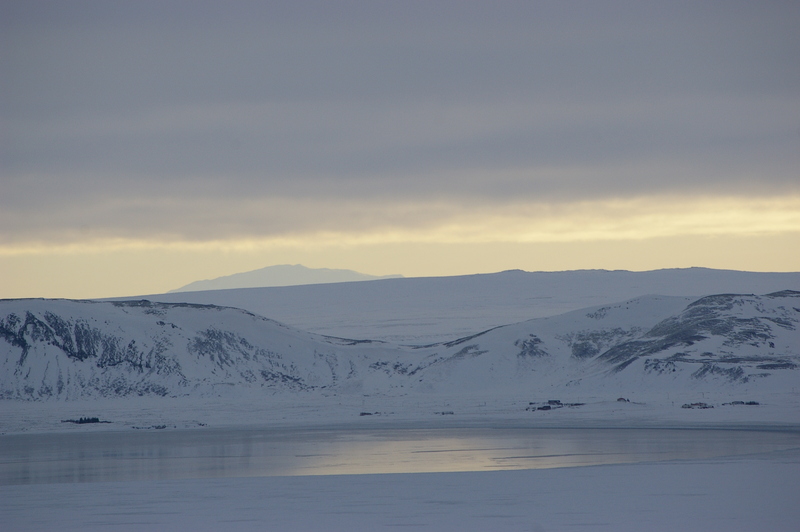 This was truly the most spectacular site that we saw during the day and one that will last with us for years to come. Despite being cold from being sprayed with the mist from the falls, it was as beautiful as anything that we’ve ever seen. 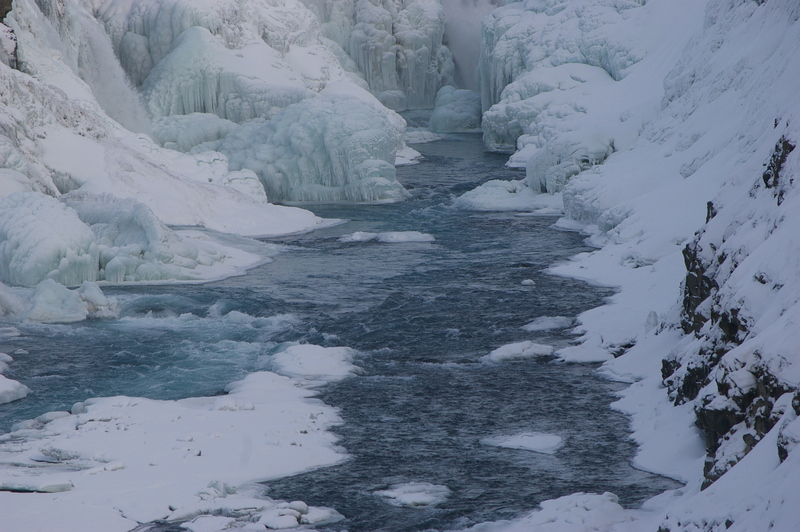 The combination of ice and rushing water made for a fascinating contrast that was mesmerizing to watch. If we weren’t so cold, we could have hiked around the falls and captured them from every angle possible for hours. 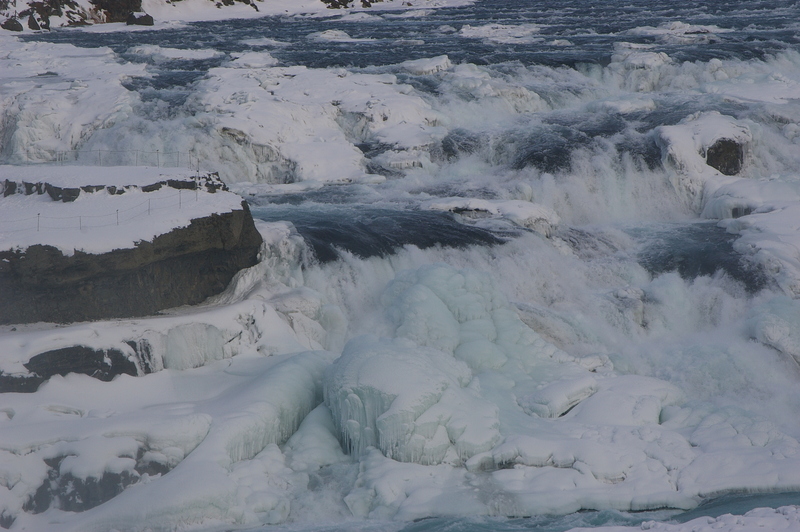 Even if you don’t have time to do the full circle, a trip to Gullfoss is an absolute must. We continued around the circle, surrounded by incredible beauty, with only one other site that we wanted to see along the way. 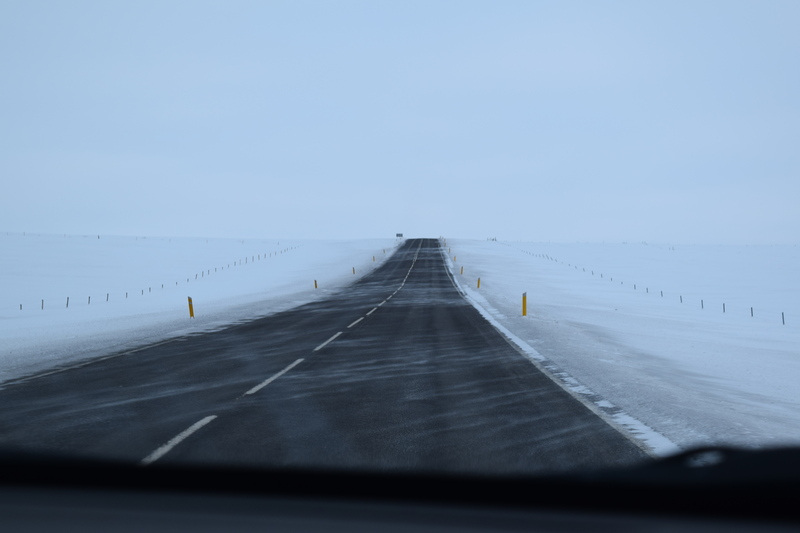 Despite the crowds that were at each of the stops, the roads were mostly empty and most of the time that we spent driving, there wasn’t another soul around, which felt a little ominous at times. It gave us a sense of how harsh it must be to live there during the winter and how hard it must have been for the earliest settlers of the island. 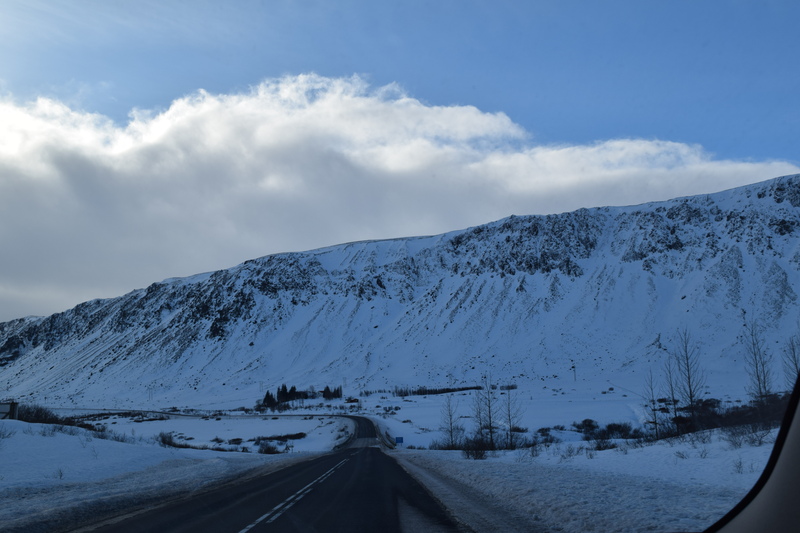 Another stop worth seeing is a volcano caldera called Kerið (pronounced Kerith in English) that is along the circle, which isn’t nearly as busy as other stops. 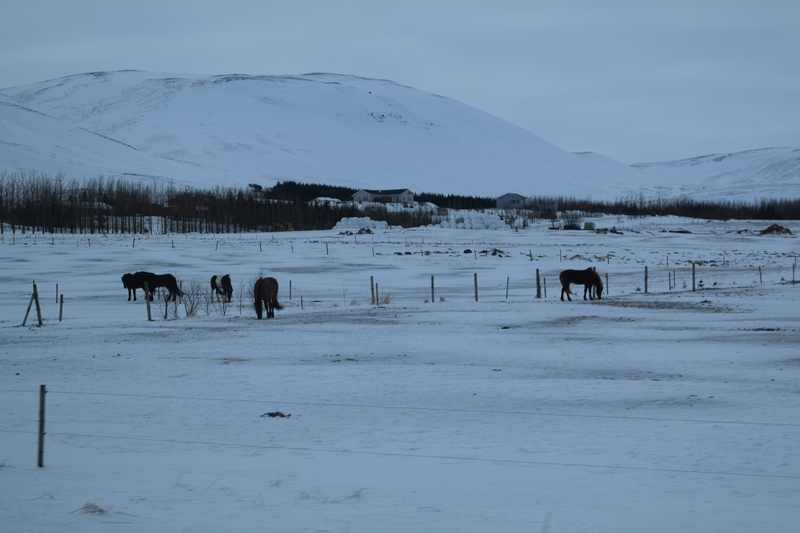 Also, no matter where you go in Iceland you will find plenty of Icelandic horses, which are furrier than those that we find here in North America. 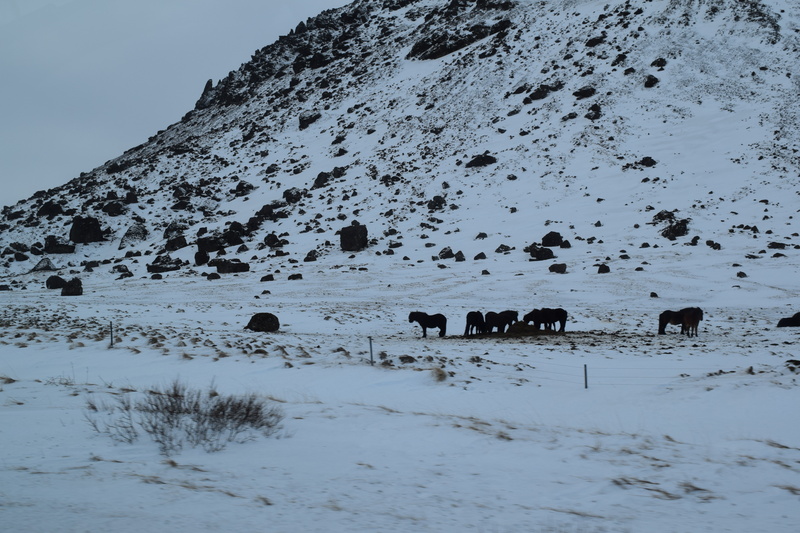 All in all, the Golden Circle was amazing, but it was only our second day in Iceland (we’ll talk about our first day a little later), so there were plenty more amazing sights to see before our trip would be over. 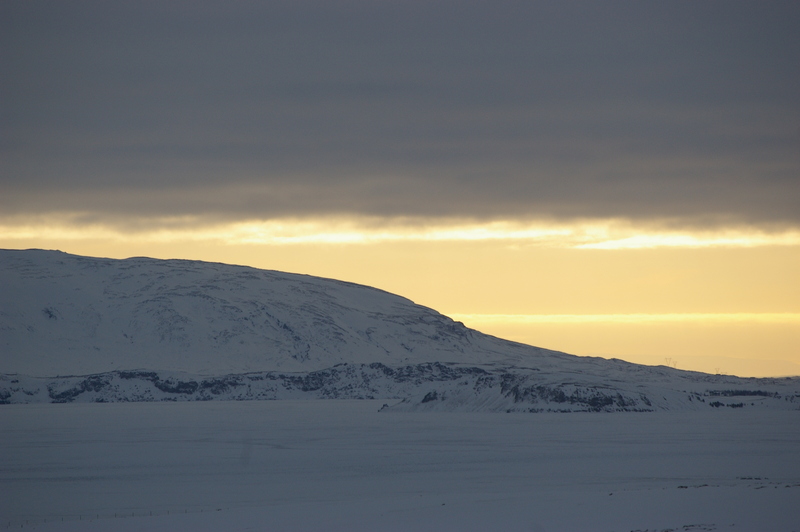 We know that we’ve said that we don’t get pictures of sunrises because we’re just not up that early, but Iceland changed that for us since the sun rises so late. We couldn’t have been happier with our decision to visit Iceland, it was one of those experiences that will stay with you forever. 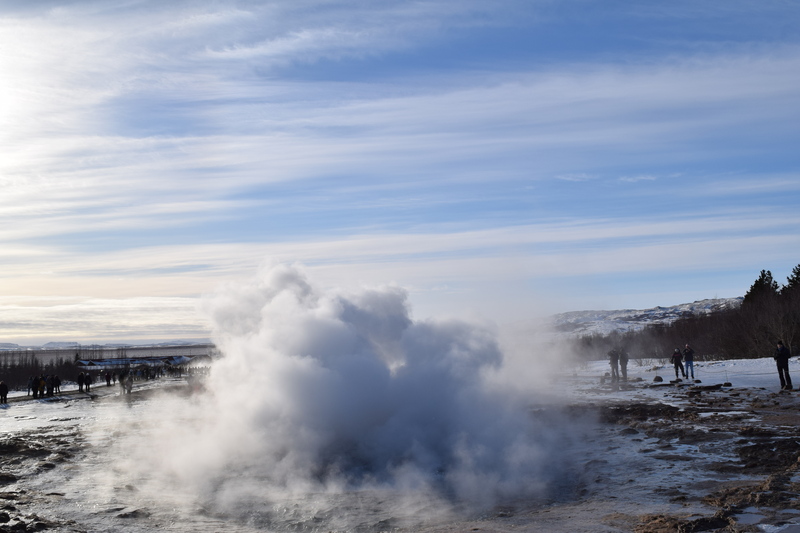 This entry was posted in Iceland and tagged Þingvellir, geyser, Geysir, Golden Circle, Gullfoss, Iceland, lake, nature, photography, snow, sunrise, travel, volcano, waterfall. Bookmark the permalink. 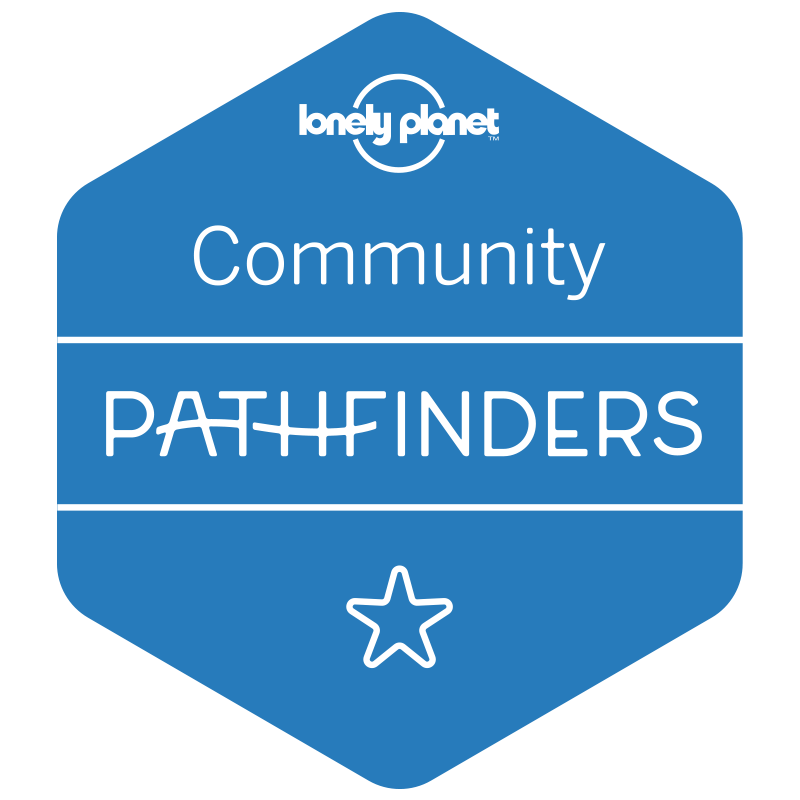 Very interesting post and photos especially as we intend to make this trip in the future. You should definitely go, it is an amazing place! Love the photos. I visited Iceland about 20 years ago, but in the summer. Love your photos with snow and ice. Breath taking scenery! Thanks for sharing. 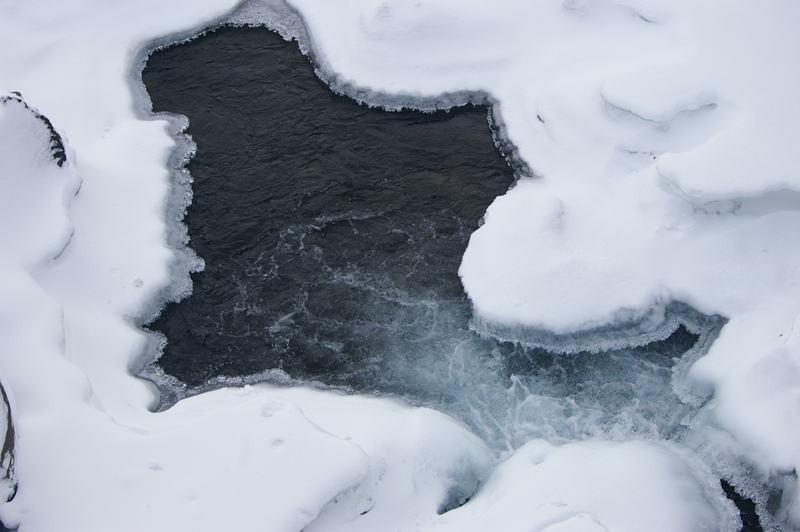 Eager to see more and hear about all your Icelandic adventures. Thanks, we had an amazing time. We’ll probably go back in the summer sometime, but it was breathtaking to see in the winter. Woww! I’d seen pictures of the geysers, but agree that the waterfall is simply stunning! OH wow! Love seeing these pics from a different time of year than we’ve been! 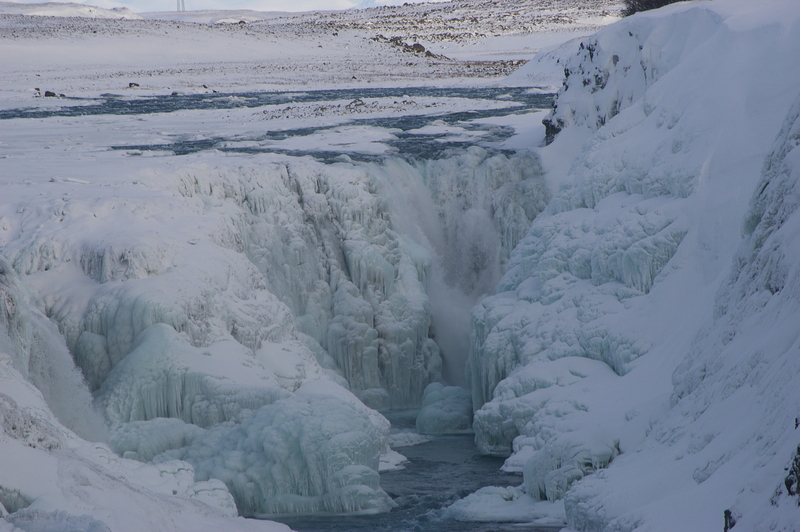 My first time in Iceland was during late November, so Gulfoss was mostly frozen on the walls of the canyon but there was still some bit of water flowing, and no snow on the ground at that point in Thingvellir (can’t find the right character on my keyboard!). This last time we were there in early July, and it was so different! Lush and green and loads of water on the falls. 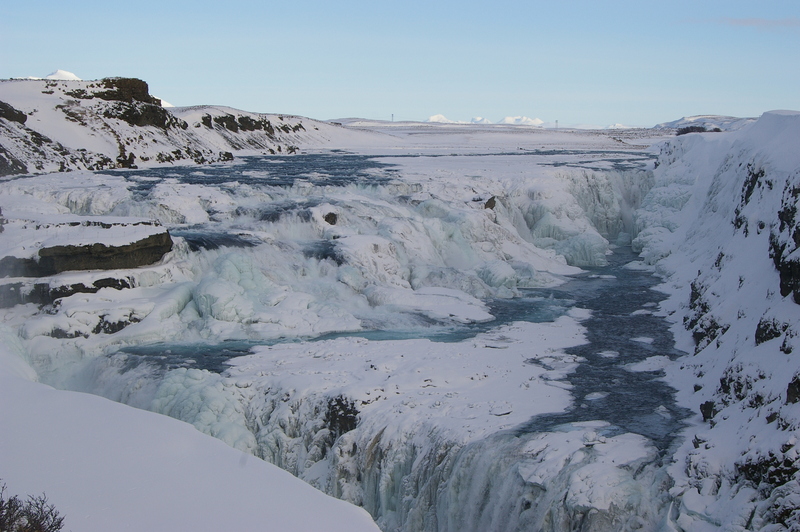 This icy waterfall pic at Gulfoss is incredible. 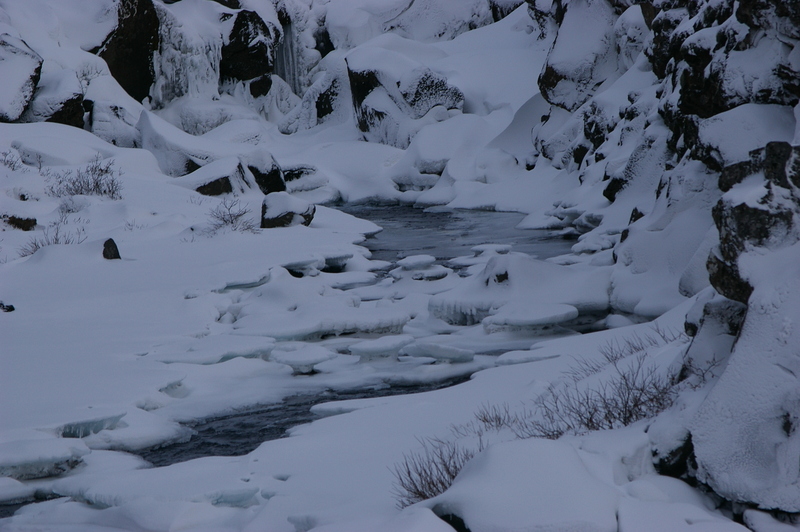 Next time, and there must be a next time as I still have LOTS to see of Iceland, I think I may like to go in winter! An interesting and helpful post! I’m going to be stopping over in Iceland for three days in August, and I was considering touring the Golden Circle (with a group, though). Ultimately, we’ll see what happens, but this has piqued my interest in the route. Thanks! Thank you for reading. We are glad you found it helpful. You will love Iceland!